Exclusively featuring the sporting options at the University of Michigan, 2015 Panini Michigan Collegiate aims to honor the athletic legacy in Ann Arbor. Highlighting only former Wolverines, the multi-sport release averages at least one autograph or memorabilia card per box. With 50 cards in the base set, several different programs at Michigan are on full display. Top football subjects include Charles Woodson, Tom Brady, Devin Funchess and Jake Long. Even former president Gerald Ford makes an appearance as a Michigan alum and standout football player from the 1930s. The NBA is represented by Jalen Rose, Glen Rice, Cazzie Russell, Trey Burke and Glenn Robinson III. Barry Larkin and Zach Putnam offer baseball options. Signatures and Memorabilia cards apply a hit element to the release with a look at the football players. There is also an autographed parallel, numbered to 99 or less. Focusing on the very top options, Honors looks at those players who have hoisted individual awards like the the Heisman Trophy or Big Ten Player of the Year. The base and insert sets are further expanded with a variety of limited parallels, including Silver, Gold and Black. 50 cards. Player position noted below. Looks great, but why no hockey? And only two for baseball, how about Jim Abbott or Chris Sabo? Also surprised Frank Clark is in there since he was kicked off the team last year. I busted 5 boxes and all cards look the same. How can one determine the silver, gold & black parallel variations? I must be missing something. Ed McArdle � The Silver parallels replace the actual background with a light silver color fill, and the Gold and Black parallels do the same and are also numbered. DO NOT COLLECT PANINI’s 2015 MICHIGAN SET!!!!!!! DO NOT BUY PACKS OR BOXES, IT IS SIMPLY NOT WORTH IT. 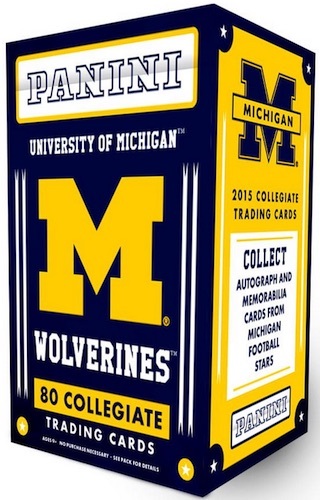 I want to alert people of the waste of money in buying the 2015 Michigan Panini set. It is unbelievable that Michigan would sanction a set like this. What’s worse is that Michigan signed a multi-year relationship with Panini. Hopefully, Michigan was smart enough to retain some control so that future sets do not waste Michigan collector’s money. I recently purchased and broke down 2 cases (40 boxes) of this set. The conclusion is that the set is a major disservice to collectors and Michigan supporters, in particular. The literature produced supporting the set is misleading. First, Panini claims that “Each box will deliver one autograph or memorabilia card.” All signatures are Authentic!� proclaims its web site. Yet 2 boxes in each case had neither an auto nor a patch. None of the boxes in either case contained 2 autos or 2 patches, so the average was well below one per pack. This means that 10% of the boxes lacked either an auto or a patch. This is a far cry from the representations that on average each box contains either. Second, Panini should probably rename the set the Devin Gardner set. The 36 boxes which did contain an auto or patch contained 7 Devin Gardner Autographs (all base) and no autographs from any other player. In addition, 12 of the boxes contained Devin Gardner patches. In case you need help with the math, a whopping 19 out of 36 (52.8%) of the boxes contained Devin Gardner material. The Gardner auto cards are worthless. The patch cards regardless of the player are also worthless. The set allegedly contains autographs from 7 different players. Statistically, it is highly improbable that 2 cases would contain autographs from one player and one player only unless (1) Devin Gardner cards are much more prevalent than any others; or (2) the distribution of cards is not random. The number of Devin Gardner cards offered on the secondary market and the absence of autographs from other players on these markets further confirms that one or both of these are true. I have now also spoken to other collectors who have confirmed the exact same experience as me. I believe that this is conclusive evidence that these cases were manually assembled. The cost of the set to Michigan fans for what they might receive is unconscionable, especially compared to Michigan’s previous relationship with TK Legacy and the quality it produced. I am disappointed that Michigan would allow its name used under these conditions and sanction such behavior by Panini. Panini wishes me luck? The odds of getting nothing but Gardner autos in multiple cases is nearly impossible. That is not luck. Luck cannot explain an occurrence that is nearly statistically impossible if the cards are randomly distributed. Panini completely ignores the fact that not every box contains an auto or patch card. So, I wrote back 2 more times. Panini ignored the question both times and shut down my service request. I opened up another one. Its customer service said that they cannot guarantee a hit in each pack. I have asked why its marketing and materials guarantee it. Either they are wrong or its customer service is wrong.